This simple question can wreak havoc in our shop. Yes, we have talented graphic designers and we have printers and tools to match colors. So why does this simple question cause me to grimace and our graphic designers to hide behind their computers? Color matching is an art that takes time, practice and expertise. If there is an actual pantone color, we can usually match it on our wide format printers. But in many cases, we need to take the original color and manipulate it to match a sample. This takes time, printing and reprinting. Time means money and usually no one wants to pay additional for color matching. Colors will also look different when printed on different materials. For example, if you print on cotton, the color will be duller looking than if it were printed on a gloss banner. When you put the exact same color on two completely different print media, they appear to be different colors. Now add light to the scenario and the color shifts once again. Interior business lighting can often make prints look a little yellow and when you take the color outside into sunlight, it may look washed out. Add an overlay laminate and the color can shift again. 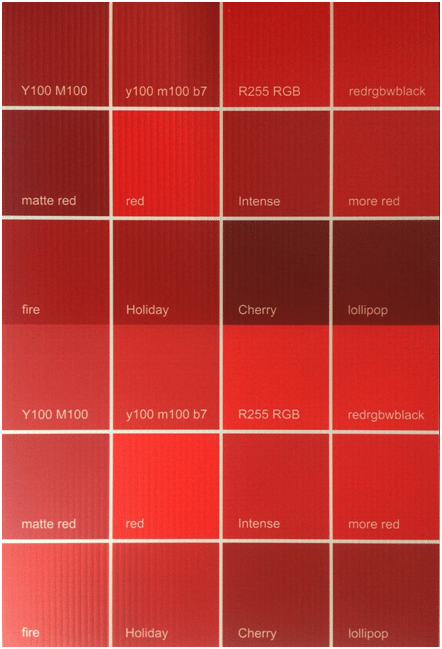 The red color chart shows the various shades of Red that we printed from our flatbed. They are all red… but which red looks true red to you? So when you ask, “Can you match this color?” and we give you a strange look — now you know why. From outdoor signage to indoor signs, dimensional letter and more, Signarama offers a wide variety of options to fit all of your business needs. Contact us today to request a quote and get started on your new design. Our Brighton, Colorado shop can be reached at 303-914-9700.